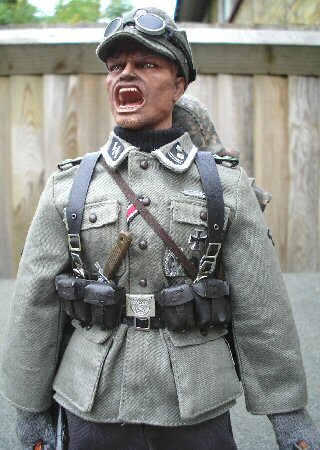 Welcome To My SS Gebirgsjager Figure Page. 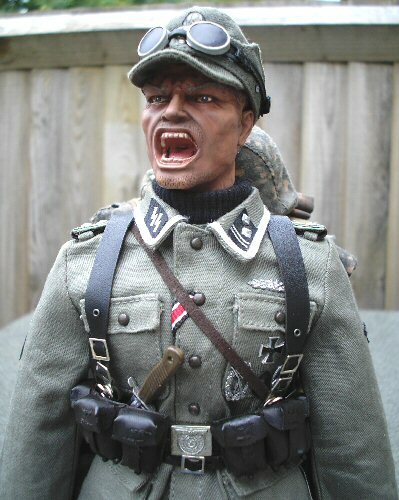 This figure came about after I did some research into the SS mountain units during WW2, and the idea for a kitbash formed regarding an NCO from an SS regiment. And after making quite a few changes to the original idea I had, I have decided to make the figure as below. 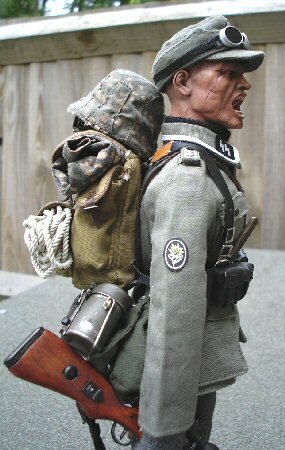 So I have used a bit of Modellers Licence here with my figure, and made him as a Hauptscharfuhrer (Master Sergeant). As I wanted the figure to look like he has seen some active service with the awards he has, plus with the headsculpt he has also been wounded. 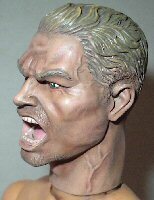 The headsculpt that I have chosen for this figure is the DiD Kurt Dorr head, as he just struck me as the perfect choice of a battle hardened sergeant. And the look I am trying to get is that the troops who would be under his command, would be just as afraid of him as the enemy would be. The first two pictures above left, are of the head as it came from the factory, the next two pictures are of it after I have given it a Brown pastel wash and a dust over lightly with some Flesh pastel chalks. Note: What I like about this headsculpt is, that the pastel chalks have only slightly lightened and altered the face. 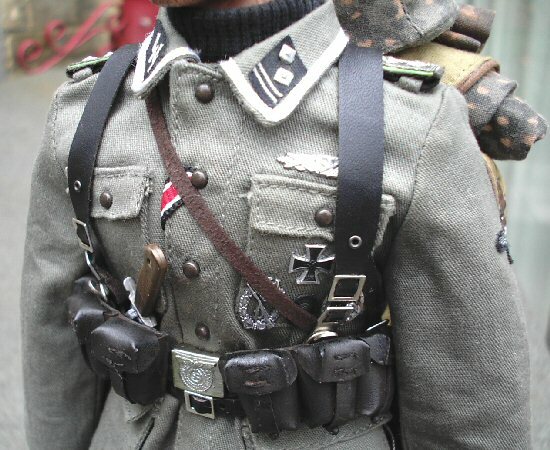 The tunic is from Toys City as it has the correct white edging on the collar for the rank I want to use, the Gebirgsjager trousers are from Dragon. 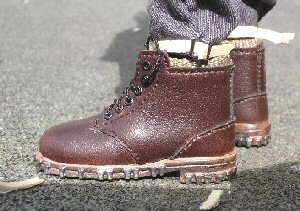 The boots and the puttees are from Toys City. 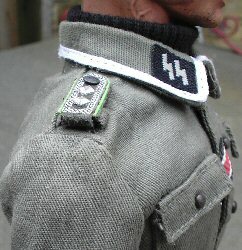 With the insignia for the collar I have used some of the woven Toys City insignia, as I do like the way that it stands out from the black backing, plus it also has some very nice scale pips for the Hauptscharfuhrer rank. 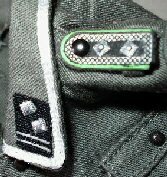 The shoulder boards are from Dragon with the centre part repainted Black, and onto each of these I will also add four of the pips as well. 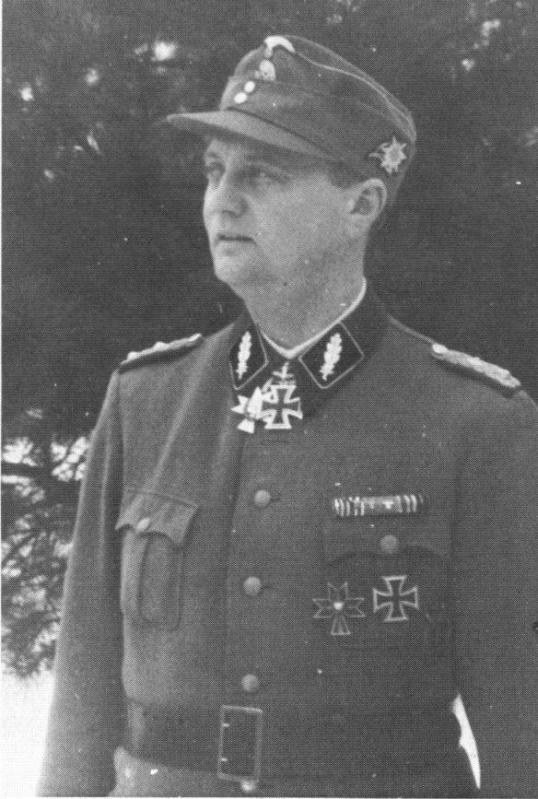 The two pictures above on the right, show the finished collar tabs and the shoulder insignia. 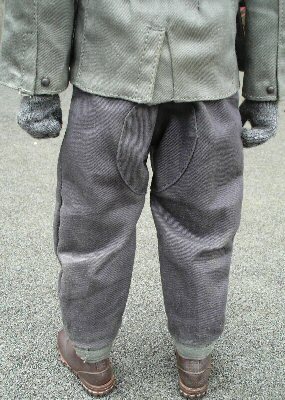 With the Gebirgsjager trousers that I used with this figure, I got them loose and they are from the Dragon Edvard Borsheim figure. 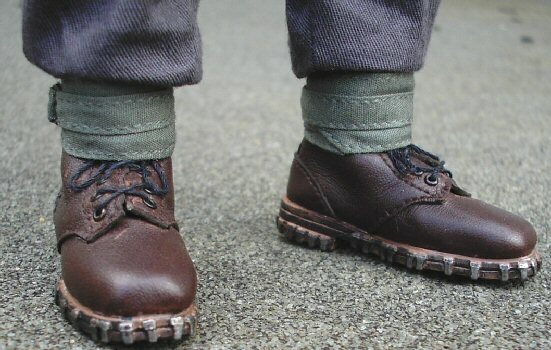 And upon checking them on the figure I found them to be well made, and I have found that the buckle on the bottom of the trouser legs really does work, plus it will help me to tighten up the trousers under the Toys City puttees. 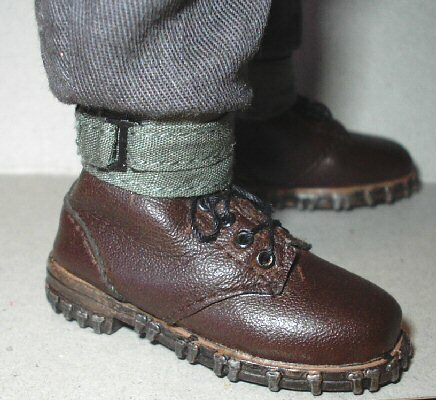 Important Note: But, be very careful in tightening up the buckles, because as shown above the vinyl strips are very fragile, and as shown in the picture above right I have tightened the trouser bottoms as I wanted but the straps broke on me. Note: I doubt very much it is fault with the product itself, the fault most likely lies with the person (me) pulling too tight on the strap which caused it to break. 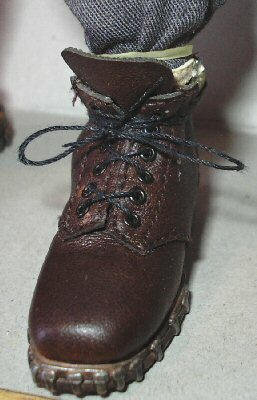 One thing I have meant to do for a while is a step by step, about how I laced up the Gebirgsjager boots. And in the pictures below, from the left to the right show how I do it. The first pictures 1. 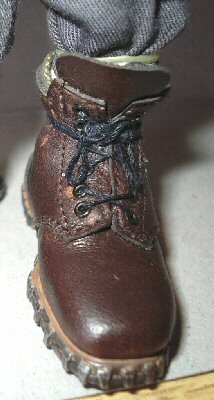 & 2. show how I have replaced the laces with some longer thread, this then allows me as I have in picture 3. been to tie a bow in the lace. In picture 4. 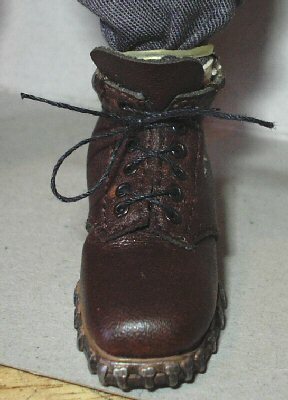 I have tied another bow, this is to keep the lace tight. 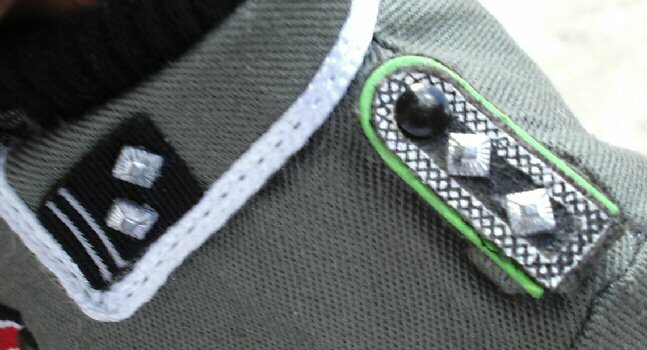 Picture 5. shows how I have made the loops in the bows smaller, by putting each loop in turn back through the lace at the side of the boot, and then pulled tight towards the knot. The purpose of this is that the loops are now getting smaller, and as shown in pictures 6. & 7. once the puttees are in place the loops are more in scale. The belt and the Kar 98 ammunition pouches I am using for this kitbash are from Toys City, as I wanted to see how they would come out after a repaint of the Black acrylic paint. 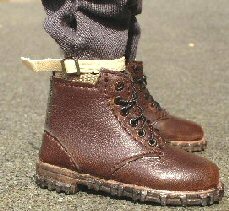 And I have found that they take the paint very well, and I get a very nice dull look to them. Note: I kept putting off using these items as they just did not look right to me (too glossy), but after the repaint, I have found that with the thin vinyl that Toys City has used, they can look very realistic. 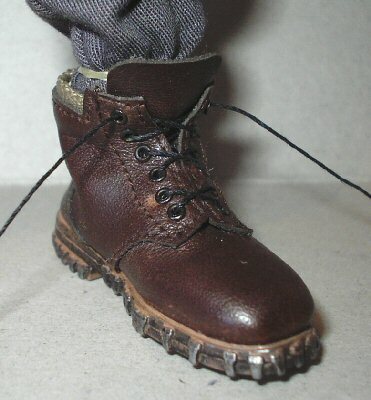 The other items that I want to use with my figure like the bread bag, shovel, bayonet, mess tin and gas mask case have all been given the same alterations treatment as shown on my Alterations pages. For this figure I decided to use some of the Toys City spare parts that I bought loose, one of these was the pistol and holster as shown on the right. And like most of the parts I use for my figures, I have to lose the factory glossy look that they have. 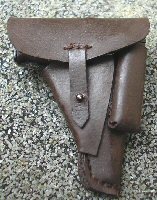 So for this holster I first tried the Model Color Matt Medium paint, and even though it gave me the flat look that I was after, but I decided to see what it would look like after a repaint with some Daler-Rowney Burnt Umber 223 artists paint. And the result is shown on the right with the photo of the holster, and I have discovered that with the thin vinyl material that is used for these parts, they really do come out very well and also they look very much in scale as well. 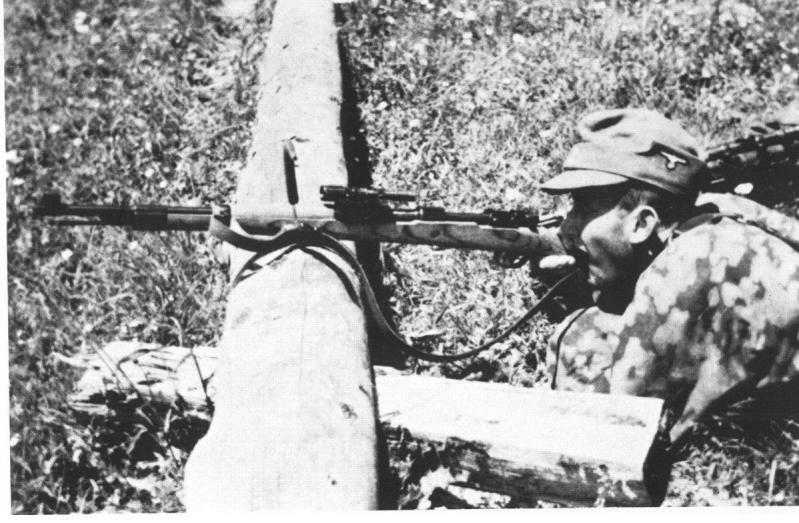 The rifle is I believe from DiD which I managed to pick up either in a trade or from a purchase, and I do like both the weight of it and the detail that it has. Although it has me puzzled at what the 'wood' parts are made from, as I suspect that it is a kind of resin rather than wood or plastic. 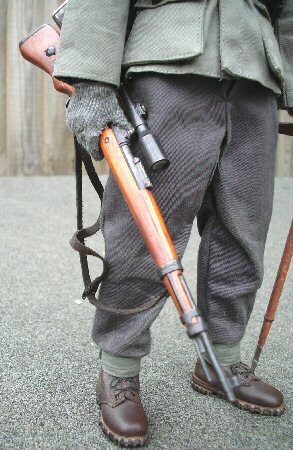 Because with this rifle I had a heck of job changing the colour of it, as it does not sand down like wood, the material is too tough when I dug into it with my model knife. 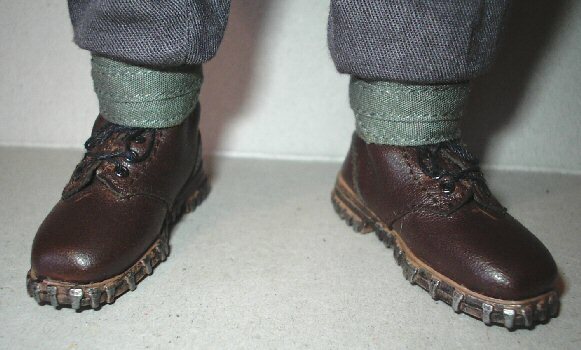 And all the Dark Tan shoe polish did was to make it slightly darker and even more glossy, so to dull it down and bring out the grain detail a bit better. After the polishing I rubbed it between my fingers, which had some Brown pastel chalks on them, and it helped to keep the darker colour plus it also helped to dull the shine down. 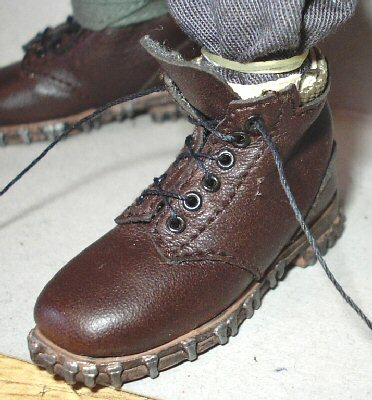 The Uniform and the trousers on this figure have as shown above in the last four thumbnails, had a very light brushing over the top of the creases with some Tamiya Light Sand weathering powder. It was done very lightly to only cover the tops of the creases, and change the cloth colour slightly. 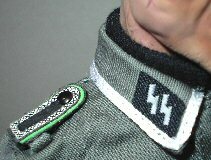 I also went over the top of the collar, shoulder and the arm insignia very lightly as well, to get an aged look to them rather than the new look that I felt they had. The final thumbnails above show the completed and loaded up figure. 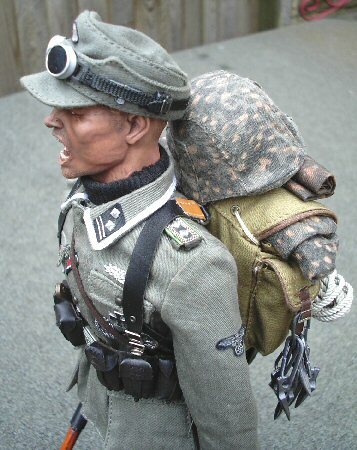 The backpack is the smaller DiD one, which has a rolled up Dragon camouflage smock in the top and a DiD zeltbahn. On the top is a Dragon plastic helmet and cover, the elastic helmet strap was replaced by a leather strap by a fellow modeller for me. At the bottom of the pack is some more of the 2.0mm polyester rope that I bought for my kitbashes. I have also had some very generous help from a fellow modeller (RogueJK), and he has very kindly allowed me to use the superb information below on this page. 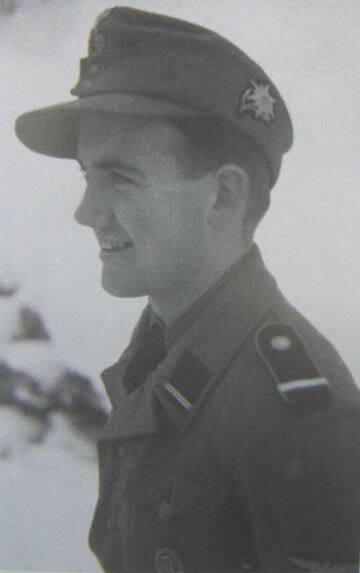 As it has helped me a lot, with distinguishing between the Heer (Army) and the SS mountain troops insignia. 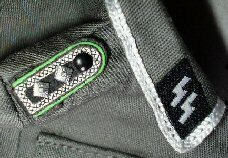 In the SS Gebirgsjager units, there are two main styles of cap insignia seen on the Bergmutze mountain cap or the M43 field cap. 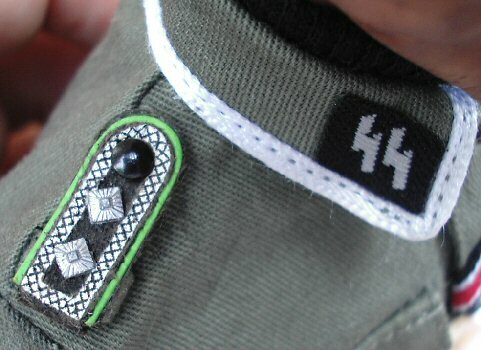 The first, and most common, was the use of the standard Waffen-SS cloth skull and eagle patches on the front, and the cloth SS Edelweiss patch on the left side. 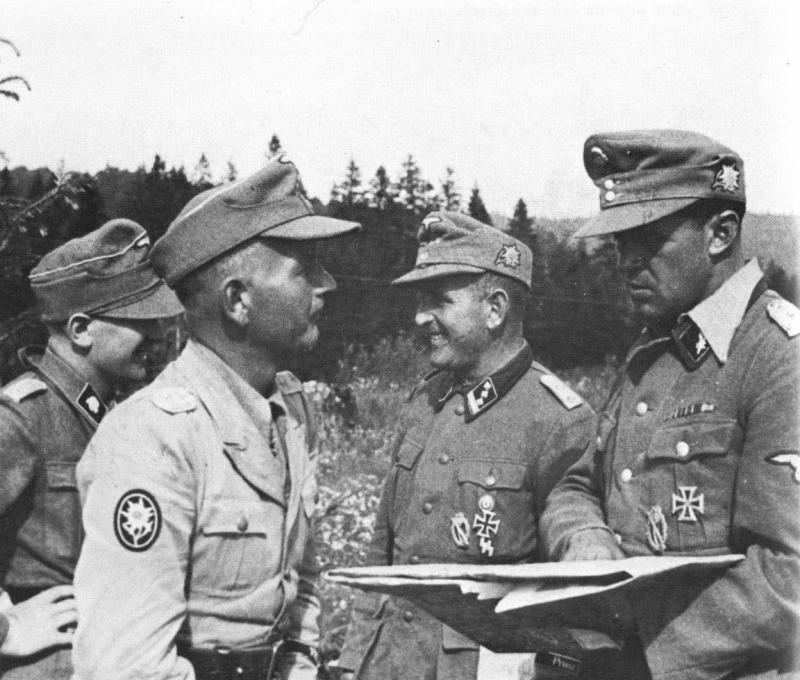 That can be seen in photo 8. below of an SS Gebirgsjager officer, as well as in picture 9. of a 7th SS 'Prinz Eugen' officer conferring with an Army officer. 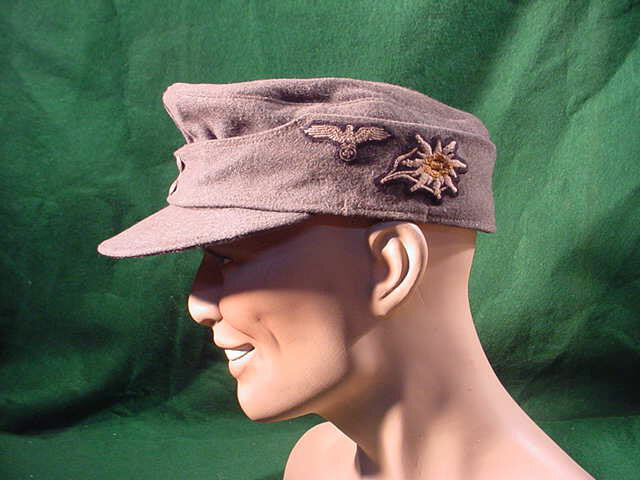 The other commonly seen style was for just the cloth skull to be worn on the front, with the eagle patch worn on the left side of the cap. This can be seen in pictures 10. 11. 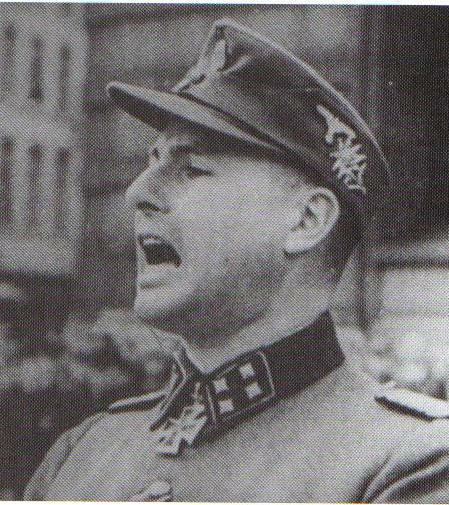 & 12. of some 7th SS Gebirgsjagers. 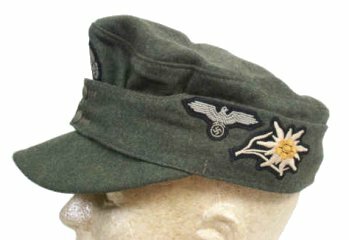 Note: While these men have chosen to wear the eagle in place of the Edelweiss patch on the left side of their cap, I recall some photos in which both the eagle and Edelweiss are both worn together on the left side. This is shown in the picture here on the right. 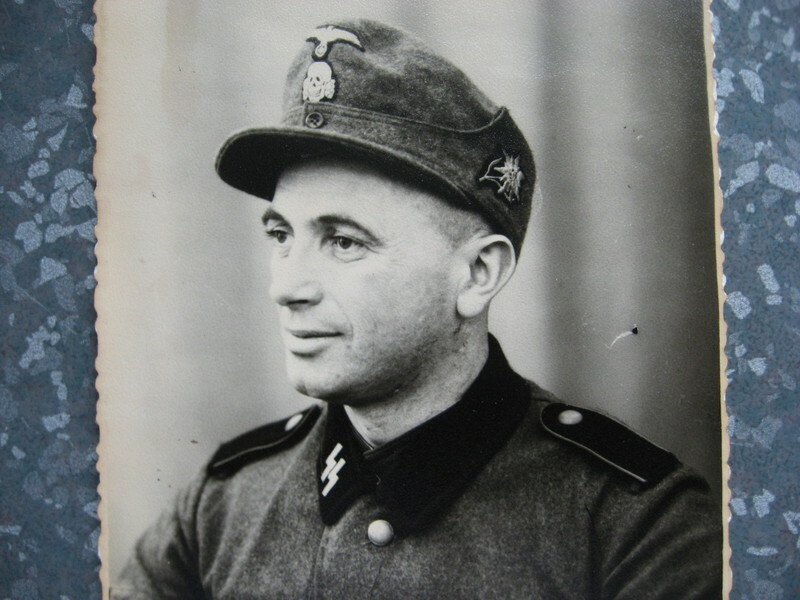 However, while these were the two most common variations, there were always some SS Gebirgsjagers who chose to deviate from the uniform standards. 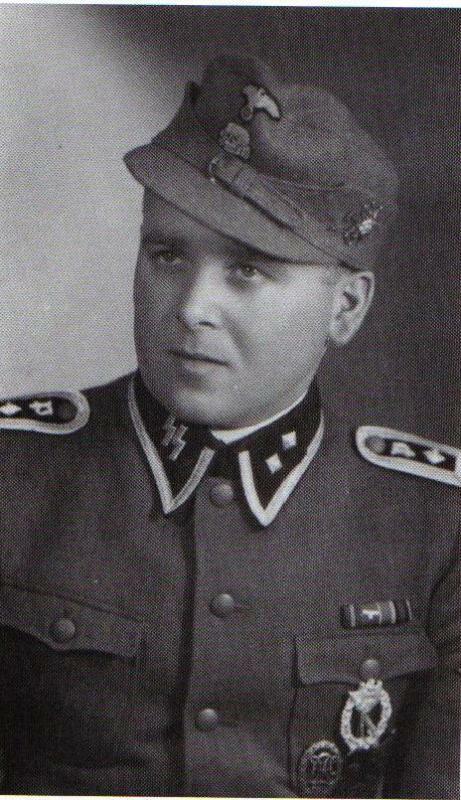 These include the SS-Gebirgsjager officer on the right in photo 13. 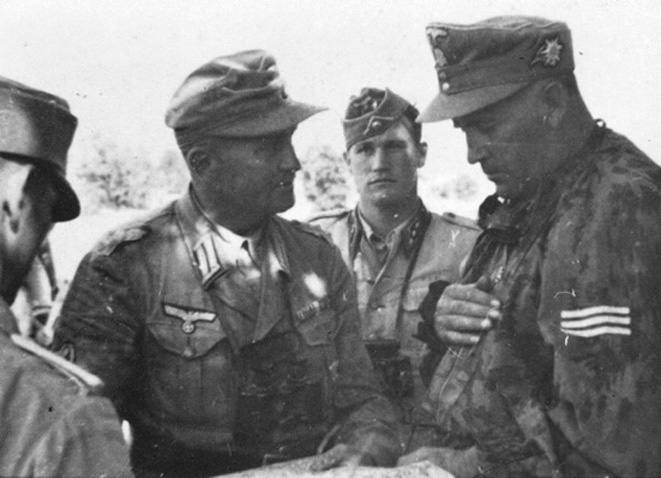 While the officer in the middle of the same photo, has the standard style insignia (cloth skull and eagle in front with Edelweiss on the side), the officer on the far right in picture 13. has also what also appears to be a metal skull on the front and the cloth SS Edelweiss on the side, and is not wearing an eagle on his cap at all. 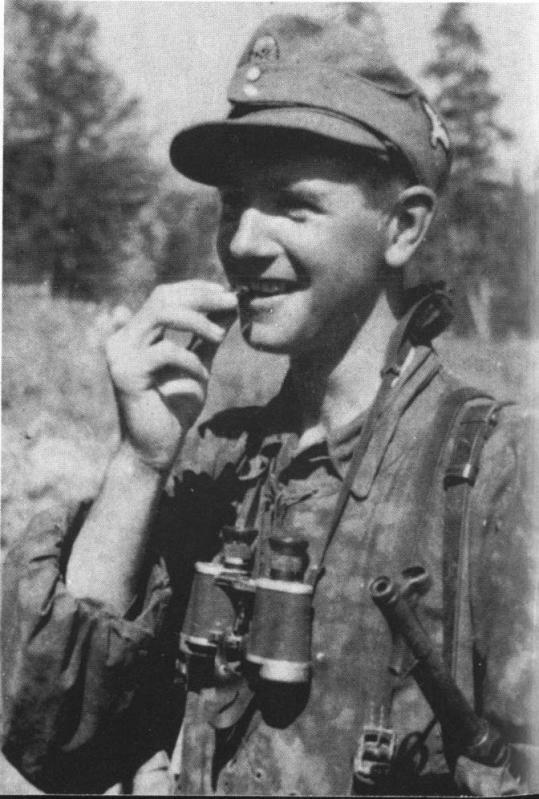 Then in picture 14. above, there's this SS Gebirgsjager, who is wearing an Army-style metal edelweiss badge on the side of his Waffen-SS cap. 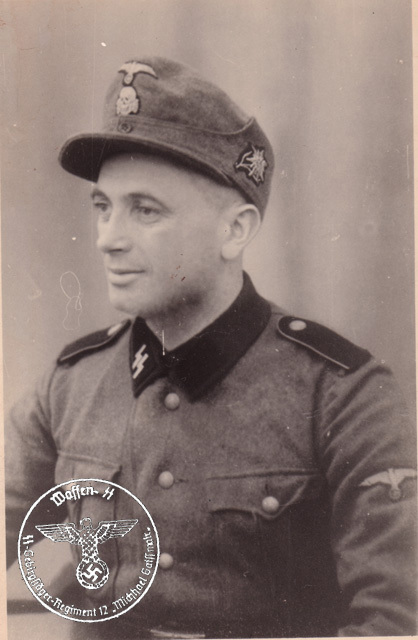 As well as this SS Gebirgsjager officer in picture 15. above, who is not only wearing an Army style metal Edelweiss along with his cloth SS eagle, but also has the Edelweiss badge pointing the wrong direction! Pictures 16. to 19. show some other SS M43 caps. 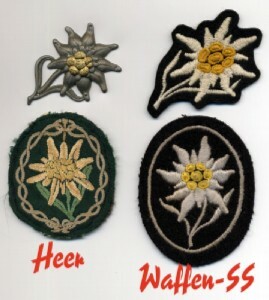 One other thing that was also very kindly supplied by another fellow modeller Heersbergfuhrer to help to clear up my confusion was the last picture as shown on the right, and it shows the differences between the Heer (Wehrmacht) and the SS M43 cloth cap and the arm insignia. 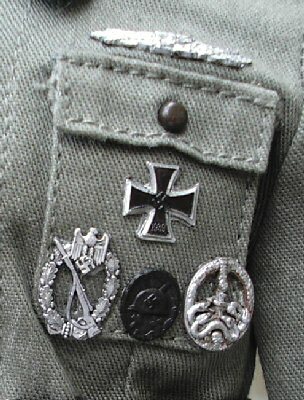 This is because as it was explained to me, the Toys City German mountain set has a Heer sleeve emblem but an SS emblem for the cap. 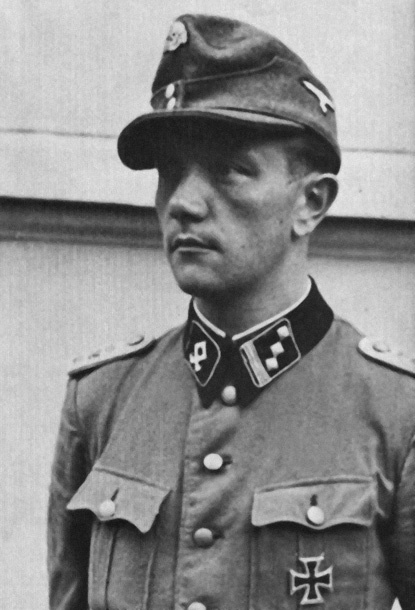 Thank you to RogueJK with his very detailed help above, regarding information about SS mountain troops. 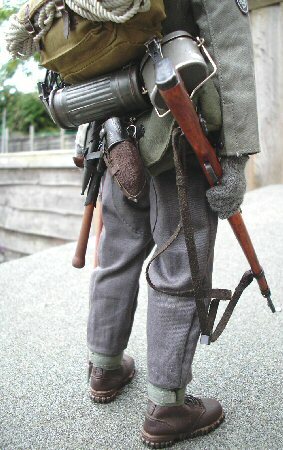 Thank you to Heeresbergf�hrer for all of the detailed help with my Gebirgsjager figure's.